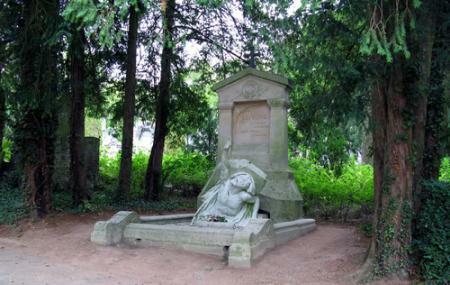 Find hotel near Cimetiere Paysager De La .. Located in the northwest of the city an 18 hectare large cemetery known for its serenity and the graves of prominent people. Commissioned as far back as 1817 the cemetery was designed to be both a park with clean and neat walkways, wooded areas along with being a burial site. People like Jules Verne, John Marest, Jean baptiste de Belloy Morgan and many others are resting here which gives the place an antique vibe to it. Trees such as ash maple, linden, scotch pines etc are as old as the graves. A beautiful place to have a stroll or sit and reminisce the bygones. Group of 15 only, by prior appointments. Ask locals to get here, Drive or walk if convenient. Cimetiere Paysager De La Madeleine Address: Cimetière de la Madeleine, 80080 Amiens, France. How popular is Cimetiere Paysager De La Madeleine? People normally club together Musee De Picardie and Parc Zoologique while planning their visit to Cimetiere Paysager De La Madeleine. Since I died, life has never been worse than when I arrived at what I believed was supposed to be the greatest place for the deceased in all of Amiens. However since I arrived, my afterlife has been an endless cycle of disaster. Would not recommend. If I could rate it lower, I would. Ce cimetière est magnifique, il est agréable et facile de s'y promener ainsi que de s'y déplacer. L'accessibilité pour fauteuils roulants est très pratique. Un cimetière hors du temps on a vraiment l'impression d'être dans un décor c'est magique surtout ne pas rater la tombe de jules Verne sublime! !